Play at Crown Bingo today and you could win some Harry Potter prizes to mark the release of the final film Harry Potter and the Deathly Hallows part 2. Play between 6pm and 7pm to earn wizard points the more points you earn, the more you can win. Get 1 wizard point on your 1 line wins, 3 points on your 2 line wins and 5 points on your Full House wins. At the end of today's tourney hour, the top 3 players will win some magical Harry Potter goodies. There's a set of family cinema tickets, Harry Potter box sets, pairs of cinema tickets and bonus to be won so if you're at a loose end later on today, head to Crown and take advantage of this offer. Crown Bingo are giving away a £1 free spin on the Big Top Tombola slot game right now as they are desperate for someone to win this huge jackpot. The prize stands at over £1.3 Million and is growing all the time, if you want to try your luck playing for this amazing prize visit Crown Bingo before Tuesday to claim your free spin. 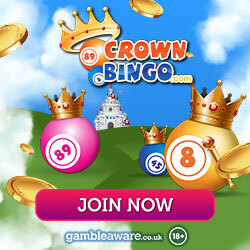 New members who join this bingo site will get a free £1 no deposit bonus to try a few games on the house as well as £25 free on your first deposit of £10.